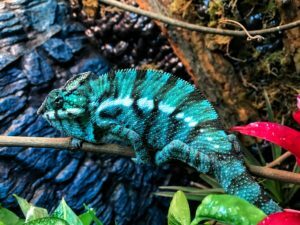 The minimum cage size for an adult male panther chameleon is 24″x24″x48″. Bigger is definitely better though if you have the space. A brand new baby chameleon doesn’t have to have an adult sized cage just yet. While they are still small an 18″x18″x36″ cage can do. We recommend keeping the floor of the cage free of substrate making it easy to clean and sanitary. The Reptibreeze screen enclosures are the most common, but DIY cages and Dragon Strand cages are also very popular. The most important thing about your enclosure is that you can set up different temperature, lighting, humidity, and visibility gradients. You want your chameleon to be able to completely regulate what they need for their bodies at any given point in time. If you have the enclosure set up properly your panther chameleon can completely regulate everything they need. Proper lighting is vital to having a healthy panther chameleon. 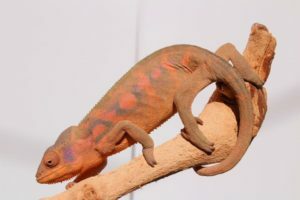 You will want to have a T5HO UVB bulb for an adult panther chameleon along with a heat bulb. We recommend Arcadia bulbs for your UVB lighting. UVB is essential for your chameleon to be able to synthesize Vitamin D which allows them to absorb calcium appropriately. 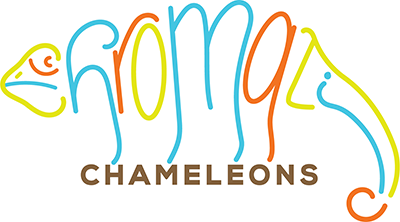 Without this, chameleons can get a serious disease known as MBD or Metabolic Bone Disease. Heat bulbs can be a simple 65 watt flood light in a ceramic heat bulb fixture. 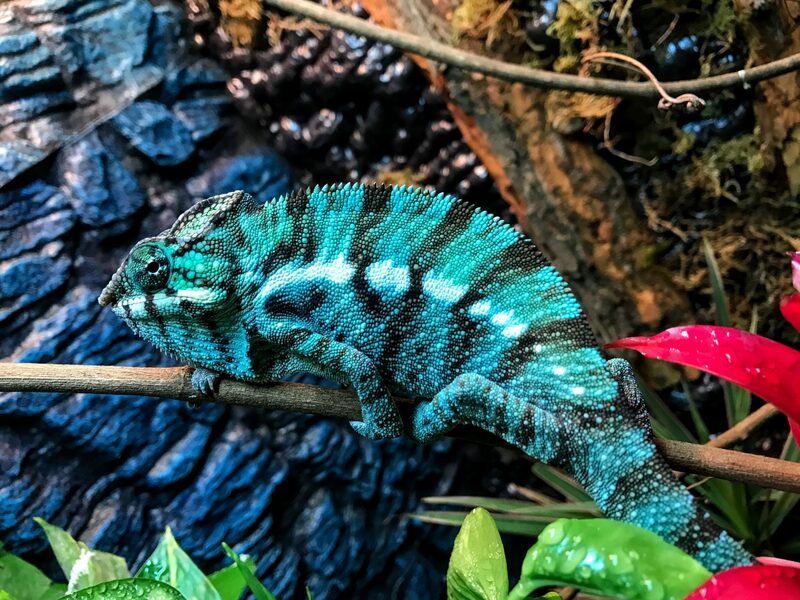 Your basking temperature for your panther chameleon should be right around 90 degrees and the ambient temperature should be around 72 degrees. Place your heat bulb in the corner of your enclosure. This will create the proper temperature gradients and allow your chameleon plenty of room to get away from the heat if they want. 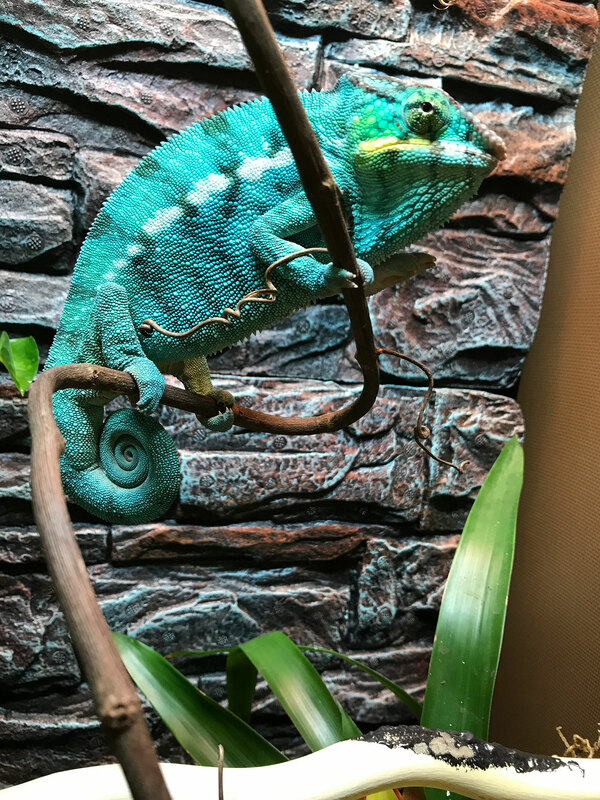 You will want to set up your vines and branches to give your chameleon access to as much are as little light and warmth as they want but make sure when placing branches that your basking branch is not closer than 6 inches from the basking spot. Keep this in mind when setting up your enclosure. You need to make sure you are providing your chameleon with appropriate humidity levels in their enclosure. 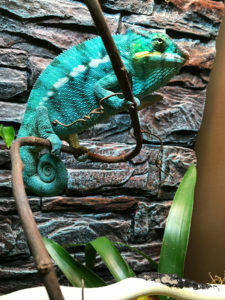 You will want to maintain a humidity level of 50%-75% in your chameleon’s enclosure. Misting is the best way to keep humidity at appropriate levels. We highly recommend the use of an automatic mister that can mist your chameleon all throughout the day at scheduled intervals. Hand misting is also possible, but you will need to make sure you have time in your day to ensure frequent misting (3-4 times a day minimum). Live plants are another great way to help maintain humidity levels. Pothos, Umbrella Plants, Ficus, Bromeliads, and Hibiscus are all great plants for your panther chameleon enclosure. These plants also offer lots of great sources for your chameleon to drink from their leaves. It is important to note that panther chameleons do not recognize a bowl of water as a water source. 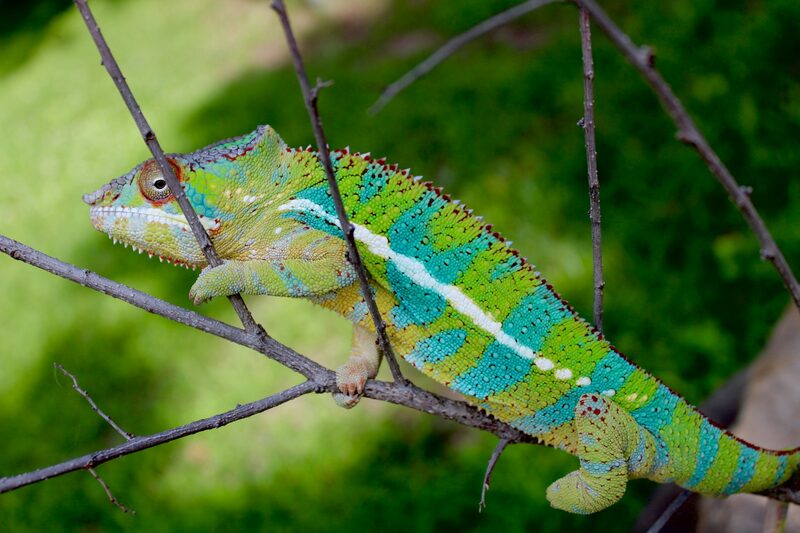 Panther chameleons spend their entire lives living in trees. They drink water as it rains on them, and they drink water off of the leaves of the trees they live in. Adequate misting is necessary to ensure your chameleon is getting enough to drink. You can also use a dripper to give your chameleon another source to drink from all through out the day. Variety is key when it comes to feeding your panther chameleon. The most common staple feeders here in the U.S. are Dubia roaches and crickets, but you will also want to offer as many different feeders as you can. Hornworms, superworms, silkworms, grasshoppers, banana roaches, wax worms, and butter worms are all also good to rotate into your feeding schedule. It is important you gut load your feeders before feeding them off to your chameleon. Many feeders do not have access to any food during shipping and some of the most important nutrition that feeder insects provide comes from the contents of their stomach. You will want to offer your feeders fresh vegetables and fruits before feeding them to your chameleons. Collard greens, dandelion greens, apples, and carrots are all good options to feed your feeders. You can also use a commercial gut load like “Bug Burger” from Repashy. Calcium and other vitamins and minerals are vital to your chameleon’s health. We highly recommend using a light dusting of Repashy Calcium Plus and bee pollen with each feeding. There are other supplementation schedules out there, but we have had great success with this method.